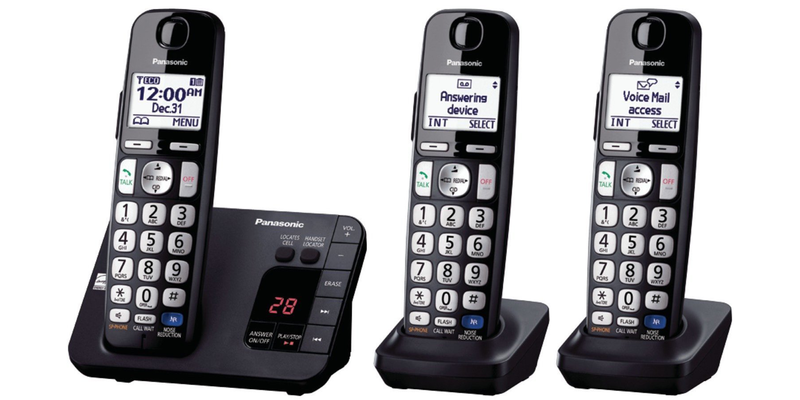 Today only, as part of its Gold Box Deals of the Day, Amazon is offering the Panasonic KX-TGE233B Expandable Cordless Digital Phone with Large Keypad (3-handsets) for $49.99 shipped. This set regularly goes for $70+ and this is the lowest Amazon has ever offered it for. Rated 4+ stars from over 3,600 Amazon customers. Hear who’s calling without having to get up with text-to-speech announcements from the base unit and cordless handsets in the home/home office. With Call Block you can avoid calls from up to 250 telemarketers, robocallers and other bothersome, unwanted caller numbers. A large 1.8-inch white-backlit LCD and comfortable, efficiently positioned backlit numeric dial keypads and buttons make home and home office calling quick and convenient in any light conditions. Whether someone’s calling from a busy city street or inside from a raucous room, Noise Reduction automatically suppresses background interference while also enhancing voice tones for clearer, more comfortable conversations.